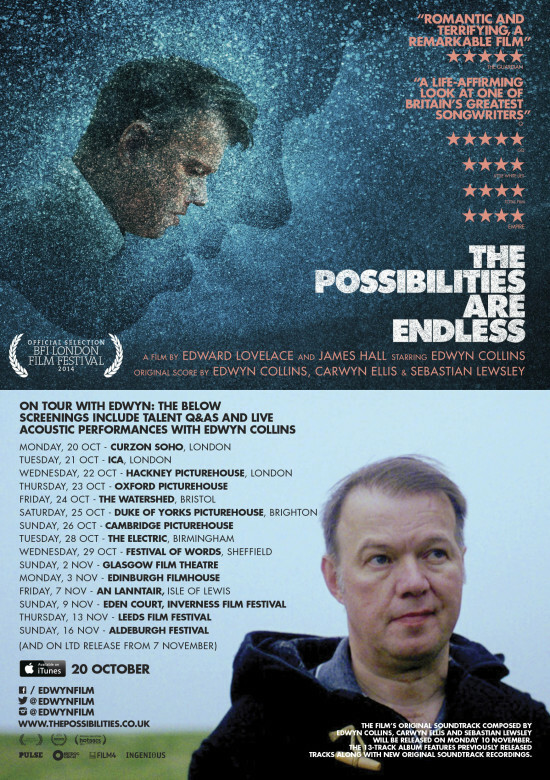 The Possibilities are Endless is a beautiful artistic documentary about musician and singer Edwyn Collins’ ongoing recovery from two major strokes. To nick the film’s publicity blurb, it is ‘a hymn to happiness, directed, gorgeously, by Ed Lovelace and James Hall about Edwyn. About finding his way back to music, to life, to understanding’. And it does look and sound gorgeous (Edwyn wrote the soundtrack without seeing the film). We saw him at the UK premiere at the London Film Festival earlier this week (sounds posh, you just buy tickets). His great wit and sense of mischief were certainly there, but his problems with walking and talking demonstrate the damage a cerebral haemorrhage can do. As the lead singer of Orange Juice from the late 70s, he had some big hits – Rip it Up being the biggest – and then a successful solo career. And he was a live wire, full of charisma but loveable and intelligent with it – when I say ‘was’ I mean still is, it just isn’t so obvious. He has aphasia – damaged speech due to a damaged brain – though more than 10 years of effort on his part has brought him from his first waking phrases, which were ‘Grace Maxwell’ (his wife’s name) and ‘the possibilities are endless’ (which his wonderful wife pointed out is a lot less profound when someone says it 80 times a day). About 152,000 people have a stroke every year in the UK, and this film shows the consequences. And Grace made it clear that they were more fortunate than many people affected by it. It made me think, there’s a whole load of people out there who might be dismissed as drunk or a bit ‘odd’ for the way they walk or speak or fail to remember. A whole load of people who are working hard to keep going, and to get as better as they can. Please watch and share – it is more than your usual documentary. Though Edwyn (and Grace) made it clear he didn’t want to be a poster boy for any charity, he did mention one that he supported – which of course I can’t remember! I found two bits of paper while doing some sorting out yesterday that made me sit down and think. And then get cross. One was a CBT (cognitive behavourial therapy) appointment letter for next month, and the other was a doctors’ note, referring me for CBT six years ago, to see if it would help me with my ‘unexplained’ chronic body pain. This will be my fifth set of CBT. The therapist-before-last decided that I had obsessive compulsive disorder because I was convinced that there was something ‘wrong’, all the time. There was, I had MS, which was hitting me physically and cognitively at random. It wasn’t an out-of-body experience, it was a buggered-body experience. I didn’t just imagine thinking was getting harder, it was. And I’m so angry about that. I’m more angry about that than I am about having MS. It isn’t ‘fair’ but life isn’t fair. There are many, many ‘unfair’ conditions that afflict probably the majority of the population at some time in their lives. Imperfection is the norm. And rotten things happen to the nicest people. We are vulnerable creatures. I am so angry that I spent years not knowing what the problem really was, and that nobody worked it out. There should be no stigma with mental health problems – that is one of the unfair conditions – but the source needs to be properly identified. I’m so angry that I was so very hard on myself and kept pushing, and blaming, and trying to figure out why my efforts to feel better and have more energy never worked. 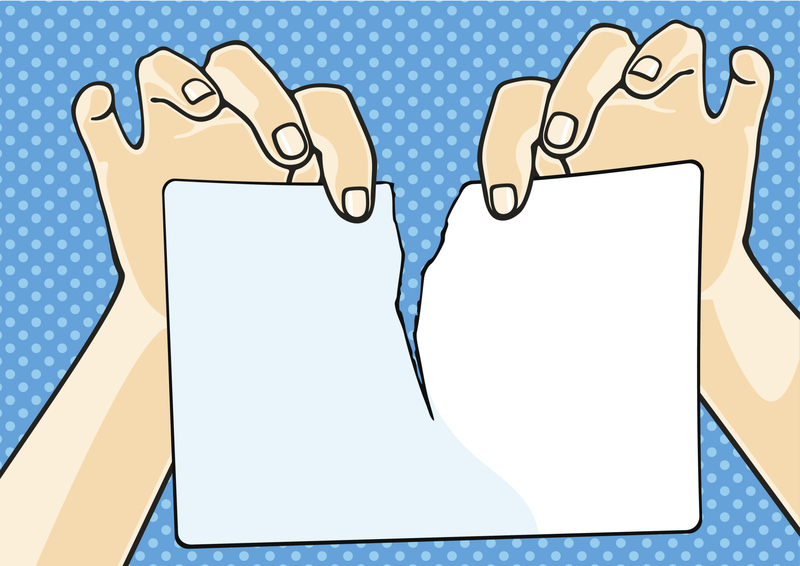 I think it would be good for me to go a bit Gestalt, and scream at an empty chair – which can be filled by all the GPs who didn’t spot what was really wrong. But here we again with the measurable CBT. I am grateful for any help I can get and realise I’m fortunate to have the chance – and I would urge anyone to step past my cynicism and try it. CBT does help. It ALWAYS helps to think about your thinking and talk about it to someone who wants to help you and is trained to do it. Always. I am expecting to score feelings and to be told about black and white thinking, catastrophic thinking, guessing what other people are thinking, and confirmation bias (which translates to ‘see, I told you that would happen!’). I will observe and track my thinking patterns and try to make them more positive as the weeks progress. I will be a good, compliant patient who does her homework, as I always did at school. My depression and anxiety scores will improve. At the end of the course, probably 7-10 weeks, there will be a graph to show how much ‘better’ my improved thinking is making me feel. There is a confounding variable, of course, which is my knack of working out what people want to hear and instinctively saying it to get a better score (at least that’s what I think I’m doing). All I have to do is carry on thinking ‘properly’. That’s the hard bit. Maybe this time will be more successful, because this time we know who the enemy is – and it isn’t me.